Cool. Great thread. I like to use a 233 tick chart for daytrading this pair. I have found very consistent results over a long period of time. Here's a look at how my session went today with the GBPUSD. I Marked up the chart to try to explain it. Hopefully it is clear. Let me know if you have any questions about it. Recent turmoil in the Middle East, Gold reaching $1400, Oil testing $100. Yen, CHF, and the USD are considered "safe Havens" when speculators become "Risk Adverse", not so much the USD anymore. Although we did see a small rally in the USD on Friday. 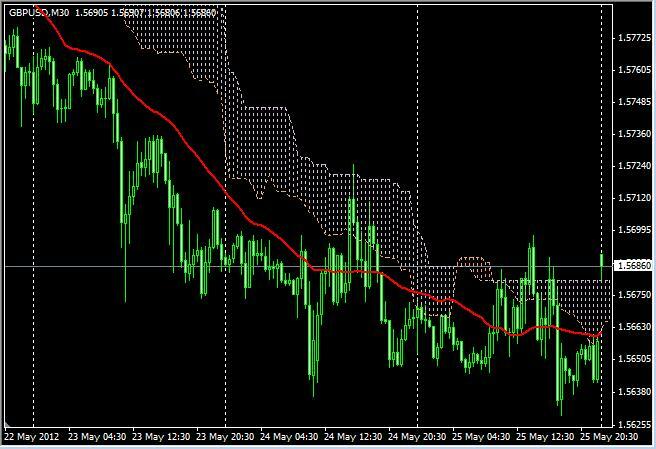 GBP/USD is more than 1 standard deviations away from the 800 SMA on the 5 M and the 1 Hr charts. I would like to enter short on a candle close below the TL on the 5 min chart. If we do not get a break below the DP I will exit. Possible TP is the 800 SMA on the 5 M, or the support on the 1 hour chart. On the 1 hour chart we have Bearish divergence. and a support TL. A close below that TL would mean a TP at the 800 SMA on the 1 hour chart. Of course the catalyst for the 1 hour playing out will probably be NFP. 800 SMA hit on 5 min, lets see if we make a move for the TL on the 1 hour. We are now down to the 1 hour TL... Abounce or a break? On Friday we had some downward movement as the Markets absorbed the news of the unemoloyment rate dropping to 8.9 No follow thru though. We did break my 1HR TL and made some pips, then encountered some strong support where I have the small rectangle. My 4 HR TL is right over the Weekly Pivot, So I do expect an attempt at it. If I re enter short, my target area would still be the 16100 area. Overall I am bBullish GBP/USD as it is expected the BOE will raise rates before the USD. This is just a slight correction. Missed my TP by 4 pips on Tues. Still in,short from 16195. The 800 SMA has moved up a bit in the last 2 days, now @16114. Adjusted TP accordingly now @ 16135. Tp Hit @16135 + 60 pips. Will post next setup when I see one. GBPUSD short for me from 1.6157. First target 1.6117 which has been hit after a brief scare of stopping out earlier this morning. Second target 1.6075 with my current stop at 1.6137 to lock in just in case it bounces back first. That would end my trade. I had a second short on a bigger picture from 1.6179 from yesterday - first target 1.6100 and second target 1.6020 -- first target almost hit so would lower stop to 1.6179 as soon as that's met. A little strange for me to have a short inside a short but that's what you get from 2.5 days of sideways trade. Ha, good for you, your TP hit @6075 as I was typing. Just finished reading this thread. Looking forward to contributing my own trades on GBPUSD. Welcome Forexnetworth! Look forward to it. Based on fib levels drawn on the downtrend of 16/7/8 - 25/1/9: Will cable rise from 1.6455 up to the last significant high of 1.7033, stop at the 50 fib of 1.6814, drop back towards the 61.8 fib level of 1.6048, or drop to 1.5711, the middle of the double top near the last sig high and a level tested between 25/7/10 and 16/1/11? Just wondering what your TP rules are e.g. move up when 20% hit and trail it up etc? BUT there really is no constructive participation from traders who know how to trade. If there is they do not show the "how, when, why" of the trades that they took. Once traders know how to really make money I think that is what they do. Geez I sit back and wonder what should I type in this post OR if I should even make this post. I lkjdsklfjopwopeiyuhhgflkepopouioidvshnlkslk nflk f,kmnsdlkffnhdslknjsdf dk,mlsdlkvfc forever. post. I lkjdsklfjopwopeiyuhhgflkepopouioidvshnlkslk nflk f,kmnsdlkffnhdslknjsdf dk,mlsdlkvfc forever. On the 15M chart price has been away from the 800 SMA( black dashed line ) more than 3 standard deviations ( 1914 candles ). We are in a just barely ascending channel. The 62 EMA ( Red ) is between the 200 SMA ( blue ) and the 800 SMA. That in and of itself is not a signal to enter a trade, but is a condition that must exist for me to concider entering a trade. A a close above the upper TL I would enter long with a TP @ the 800 SMA ( approx 141 pips away. As I was typing and posting the above, we are testing the lower TL, In which case all bets are off. If we see 15270 again I'd stick my toe in the water with a buy. to at least 15400 - 15420.